So, you have avoided the Downtown festivities because you didn&apos;t want to drop $25 to get into the NFL Experience or a couple thousand for the Super Bowl. 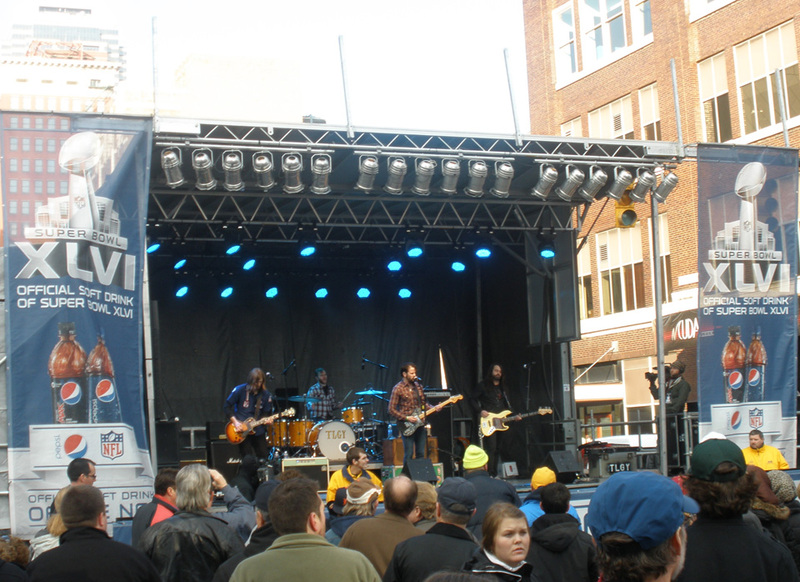 Well, the good news is if you don’t mind the crowds and perhaps the cold, you can still be a part of the festivities for free by visiting the Super Bowl Village. 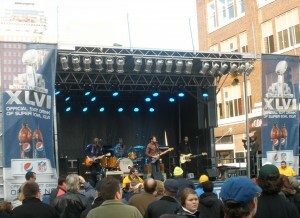 I have to admit that I spent some time in Super Bowl Village Friday, Saturday and Monday, and it started out a little slow for me. But the arrival of the national media this week, including ESPN and the NFL Network, added another element of excitement to what was already a party atmosphere. As you stroll down the epicenter of awesome as it is called, it really lives up to its name. You really never know what you might see. 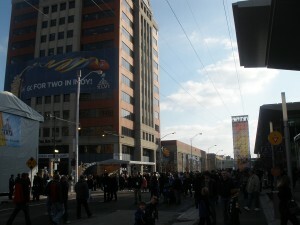 Celebrities, ice sculptures, outdoor bars and of course the zip liners flying overhead give you plenty to take in. If that isn&apos;t enough, the Village also boasts two stages with numerous bands and some big national headliners playing every night. I would suggest trying to get a map of the Village to make sure you don&apos;t miss anything. My first visit on Friday included my family. Two large wheels that I equated to hamster wheels caught my 4-year-old son&apos;s eye. He, of course, asked me what they were, and at first I didn&apos;t have an answer. Upon further inspection, these wheels were one of the interactive displays in the Village called the Super Dash. Fans get in the wheel and begin running. Lights illuminate every 10 yards until they reach 100 yards to give fans the sensation of running the length of a football field. Before Monday&apos;s heat wave, we did start to get cold and found a nice respite stopping at one of the warming zones. 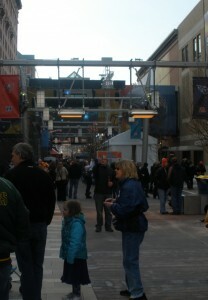 These areas - 13 in all along the three block Super Bowl Village - feature heat lamps that add a nice touch. The vacant Nordstrom building called The Huddle also provides a spot to get out of the elements. We also made sure to stay long enough to enjoy the nightly light show. After returning briefly on Saturday with my dad, I stayed a little longer on Monday after zip lining with one of my co-workers and her boyfriend(more on that adventure tomorrow). This is when the Village, at least for me, kicked up a notch. We ventured into Pan Am Plaza to witness the first day of ESPN programming. For an ESPN junkie like me, this was so much fun. SportsNation was broadcasting live outdoors. Starring Colin Cowherd, Michelle Beadle and Herm Edwards on Monday, we watched as the live show featured segments with Indianapolis Colts kicker Adam Vinatieri and Pittsburgh Steelers defensive lineman Brett Keisel, who is known as much for his beard as his play on the field. It was so cool to see the show live, and I even was able to snag a souvenir when they began throwing T-shirts into the crowd. Then, just behind that set, we began watching some preparations for SportsCenter as former football players and current ESPN analysts Tom Jackson and Cris Carter waived and even blew some kisses to the crowd inside their Plexiglass digs. There is so much to see and do for just about any taste that I really would encourage anyone to check it all out. Don&apos;t forget while you&apos;re in Central Indiana that there are still a few hotel rooms available in Hendricks County, call our office at (800) 321-9666 for availability. Also, be sure to check out our Super Celebration Site at the Metropolis Shopping Center and all our dining and entertainment options.